The Microsoft Classic IntelliMouse is a very successful reinvention of the iconic mouse. Even if you’re not familiar with the original, this is still an excellent – and well-priced – mouse that does the job well with minimal fuss. In the late 1990s and early 2000s, Microsoft released a range of peripherals for Windows PCs that, thanks to their relative simplicity, reliability and ergonomic designs, became very popular amongst PC owners. 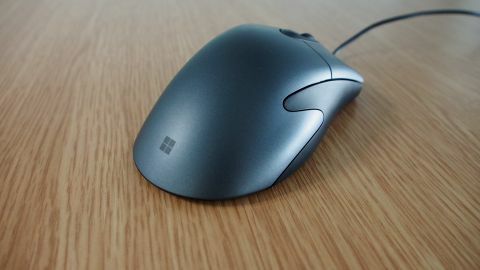 One of the most well-loved devices made by Microsoft during this time was the IntelliMouse, and now the company has revisited the iconic brand with the Microsoft Classic IntelliMouse, which according to Microsoft is inspired by the IntelliMouse 3.0. We’ve seen that companies targeting the nostalgia for its older hardware can be very successful – take a look at the popularity of the Nintendo SNES Classic Mini, or the Lenovo ThinkPad Anniversary Edition 25. As our devices become ever more complex and convoluted (as well as delicate), there is a lot of appeal about older hardware that’s solidly built and does the job without fuss. Chunky and ‘retro’ designs can also help. It’s this nostalgia and goodwill that Microsoft appears to be targeting with the Classic IntelliMouse. But, is it a successful resurrection of an old brand, or just a relic of a bygone era that’s better off buried? The Microsoft Classic IntelliMouse is available to buy right now, and it’s on sale for $39 (£39, AU$69) from the Microsoft Store. This is a pretty reasonable asking price, especially if you compare it to the Apple Magic Mouse 2, which is Apple’s own pared-back mouse, and which goes for $79 (£79, AU$109). While the Magic Mouse 2 is wireless, the Classic IntelliMouse has a lot more going for it when it comes to customizable buttons, and other features. Of course, there are cheaper mice out there – just check our list of the best mice for a good selection, but we think Microsoft has priced this just about right, considering the features and build quality. As we mentioned earlier, the Microsoft Classic IntelliMouse takes its design cues from the IntelliMouse 3.0, which was released in 2003, and has continued to enjoy something of a cult status amongst gamers. With the Microsoft Classic IntelliMouse you can clearly see the inspiration, with a similar ergonomic shape and black and gray design. For many people, this will be a case of ‘if it’s not broke, don’t fix it’, but if you were immune to the charms of the IntelliMouse the first time round, you may fine yourself feeling equally unimpressed here. The Microsoft Classic IntelliMouse alongside its inspiration. Fans of weird looking ergonomic mice, or gaming-orientated pointers that pack in loads of buttons and glorious RGB lighting, will also wonder what all the fuss is about. Sure, there is some lighting, with the iconic red light of the original IntelliMouse now replaced with a modern white light. It also has a decent number of buttons, five in total, with three that are customizable. This is definitely a productivity-orientated mouse, but like its predecessor, its simplicity and reliability should allow it to appeal to gamers and other users as well. It’s also wired, which means you don’t get the freedom of a wireless mouse, but you also don’t have to worry about running out of battery at inopportune moments. It also means the mouse is lighter than wireless mice that are saddled with batteries, with the Microsoft Classic IntelliMouse weighing 3.39 ounces (100g). Its compact body (that measures 132mm x 69mm x 43mm) fits neatly into the hand, showing that Microsoft still knows a thing or two about designing an ergonomic peripheral. At the end of the day, how comfortable a mouse is to use, and how reliable it is, are far more important than flashy designs, or retro aesthetics. Thankfully, the Microsoft Classic IntelliMouse hasn’t forgotten this. The Microsoft Classic IntelliMouse uses a USB 2.0 connection, and as you’d expect from a Microsoft peripheral, setting it up in Windows 10 is nice and simple. Configuring the extra buttons is pretty straightforward, and this can be done when using Windows 10, Windows 8.1, Windows 8 and Windows 7. Frustratingly, the option to configure those buttons isn’t available in Windows 10 S. This is Microsoft’s stripped-back version of Windows 10, and preventing it from a pretty fundamental feature of its own mouse makes the operating system even less appealing. Also, despite this being a Microsoft mouse, you need to download additional software to configure it – the Microsoft Mouse and Keyboard Center. While this isn’t too much of a hardship, and installing extra software to configure peripherals is a common occurrence, we were kind of hoping that it would all be handled within Windows 10. The app is at least easy to use and nicely laid out, and you can configure the buttons depending on what app you’re currently using. Despite its retro looks, the mouse includes some pretty modern features, giving it a level of performance that the original IntelliMouse lineup could only dream of. It has a 1,000 reports per second report rate, which makes it feel fast and responsive, even when your frantically moving the mouse cursor all over the desktop. It also includes Microsoft’s BlueTrack technology, which is designed to allow the Microsoft Classic IntelliMouse to work on almost any surface, no matter how reflective it is. While using the Microsoft Classic IntelliMouse, it had no issues working on a range of surfaces, including a desk and carpet, and at all times it felt fast and responsive. We also tried the Microsoft Classic IntelliMouse alongside an original IntelliMouse Explorer 3.0 to compare the two. The design of both is very similar, and both feel very alike in the hand. The new Classic IntelliMouse does feel heavier than the original, but we actually like this, as it makes the mouse feel more weighty and robust. Overall, we are very impressed with the performance of the Microsoft Classic IntelliMouse. If you’re after a dependably performing wired mouse, with some decent customization options, then you’ll be very pleased with this. When a company goes to reinvent one of its iconic products, there’s always the danger that it misses the point of what made the original so popular. Or, it chooses a product that no one really wanted to see again. With the Classic IntelliMouse, Microsoft has avoided all these pitfalls. The original line of IntelliMouse products still has its fans, and Microsoft has kept what people love about those older mice, while adding and improving features to bring it up to date. The result is a mouse that is both familiar and modern, offering the ergonomic comfort and dependability that IntelliMouse devices were known for. The design retains the iconic look, while also modernising it, and perhaps best of all, Microsoft is asking a pretty reasonable price for it. So, the Microsoft Classic IntelliMouse isn’t just a retro collectible for people who wish we still had chunky beige PCs and CRT monitors, but an excellent mouse that does the job very well, while also offering a few nice tricks as well. This is a welcome return, indeed.